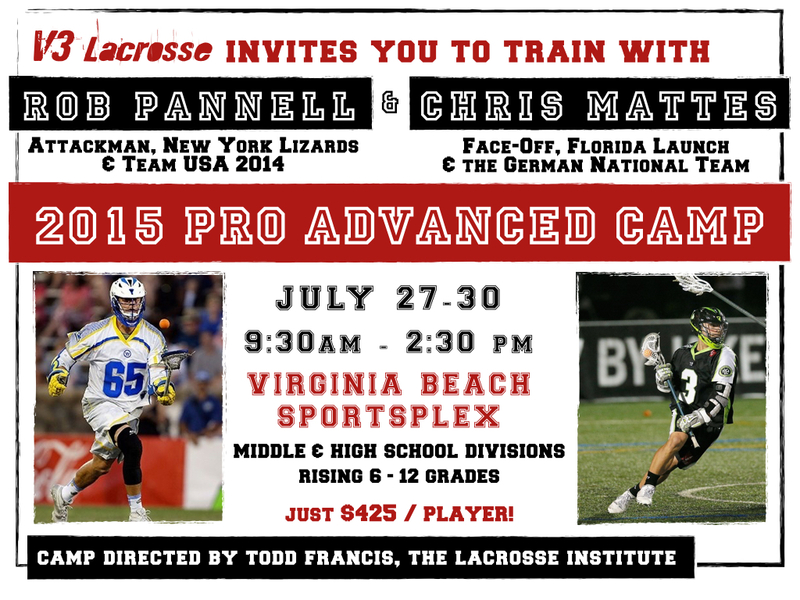 Advanced Training Camp led by current Major League Professional Lacrosse players Rob Pannell & Chris Mattes and directed by Todd Francis of the Lacrosse Institute! Registration is open for all experienced and advanced players who are interested in attending this advanced Day Camp. This is a high tempo camp for all positions. This camp is NOT suitable for beginners. There will be Middle School (rising grade 6-8) and High School (rising grade 9-12) Divisions. Note: Younger Select level players (rising 5th grade) will be considered depending upon their physical size, maturity and experience level. There is a significant discount for Team registration - High School coaches may attend with their team (15 players minimum). Camp will feature several well know MLL / NLL Professional Lacrosse players along with current NCAA/MCLA Coaches. V3 Lacrosse coaching staff will be assisting so that we maintain a ration of approximately 8 campers per coach. Coaches from regional NCAA lacrosse programs will be invited to attend the afternoon games and the All Star game! Camp runs from 9:30am - 2:30pm. Morning sessions will consist of intensive advanced skills training for all positions. Afternoon sessions will consist of team practices and competitive full field games. There will be an All Star game on Thursday afternoon. A non-refundable deposit of $150 is due upon registration - the balance is due by June 15th. Attendance is limited and Registration will close as soon as capacity is reached. There will be an optional FaceOff Academy clinic on Tuesday from 4-6pm. The cost for this is only $85 for players registered for Pro Camp and $125 for players who are not enrolled in Pro Camp. Our coaching staff includes two NCAA Division I All Americans and over 30 highly experienced coaches with years of experience as players and/or coaches at the youth through high school varsity level. V3 Lacrosse is a US Lacrosse Member Organization. All players are required to join US Lacrosse ($25 per year which includes player insurance and a subscription to Lacrosse Magazine). MLL is a trademark of Major League Lacrosse.